A kitten’s stroll down a keyboard leads to a celebrated one-minute composition in this charming portrait of a remarkable true friendship. Lesléa Newman is the author of more than sixty books for readers of all ages, including The Best Cat in the World, illustrated by Ronald Himler, and Hachiko Waits, illustrated by Machiyo Kodaira, and October Mourning, a Stonewall Honor Book. She lives in Holyoke, Massachusetts. Amy June Bates has illustrated more than forty books for children, including Waiting for the Magic by Patricia MacLachlan and The Dog Who Belonged to No One by Amy Hest. Her work has been honored by the Society of Illustrators. She lives in Carlisle, Pennsylvania. Based on a true incident, this delightfully told story is unlikely and adorable in equal parts. Bates’ watercolor, gouache, and pencil illustrations feature an un-anthropomorphic kitty whose inquisitive and quizzical nature will be familiar to all cat owners. The author’s note offers all the answers readers will want. An absolute charmer! Newman’s great affection for her subject is evident, yet she never crosses into cutesiness or sentimentality; her reportorial tone is a perfect match for her down-to-earth, generous hero. Bates, working in hues of parchment and gold, produces some wonderfully warm vignettes, pushing the graceful realism of her watercolor, gouache, and pencil drawings just enough to add a glint of magic to a story that’s already one of a kind. This adorable account is as warm and fuzzy as Ketzel herself and all the sweeter because it's based on fact. The watercolor, gouache, and pencil illustrations suit the text perfectly, delightfully capturing Ketzel's furriness, the story's charming, lively energy, and Moshe and the "composer's" loving friendship. Truly, the cat's meow. 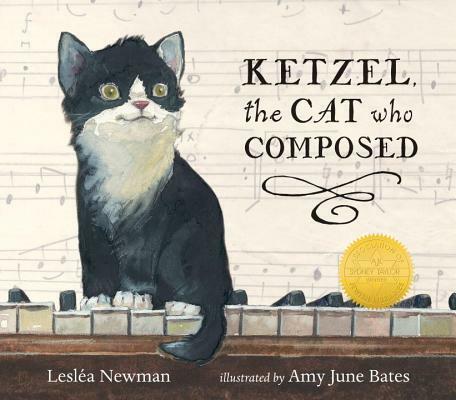 Musicians and cat lovers alike will enjoy this charming picture book based on a true story...A delightful read. This charming vignette is based on a true story, which encourages readers to suspend disbelief to enjoy a quirky plot and wonderful illustrations...Recommended for the picture book crowd and cat lovers of all ages.